Our recent blog post about CSG’s heritage showed the importance of history to this company. Developing the idea, we thought it might be interesting to take a closer look at one of our sites, our processing facility in Cadishead, near Manchester. Like many towns in the swathe of territory between Manchester and Liverpool, Cadishead became thrust into the heart of the Industrial Revolution by the construction of the Liverpool & Manchester Railway from 1826. In fact, Chat Moss, an area of marshland just north of our site became notable for the challenge it provided to the railway’s engineers, led by the renowned George Stephenson. 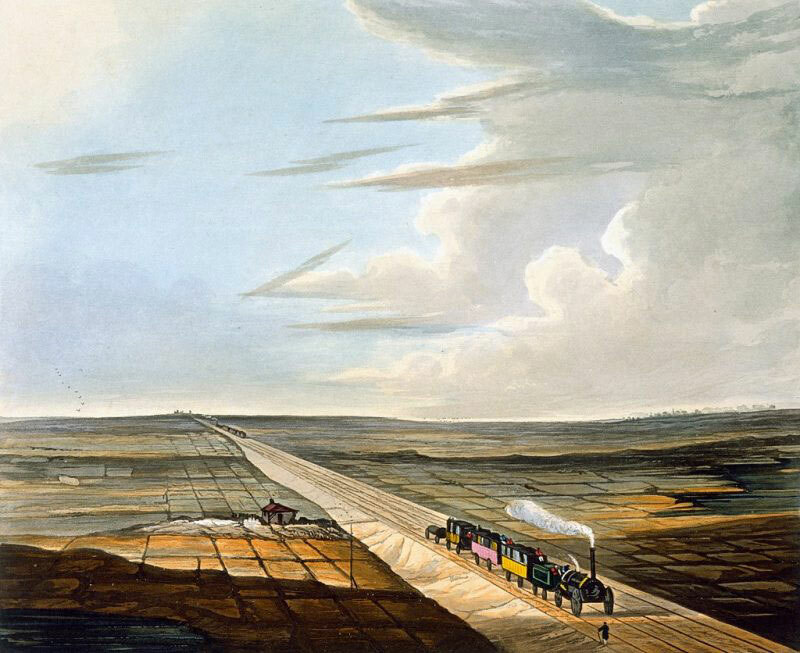 Four years later, on September 15th 1830, the new line, a marvel of the Victorian age, opened to wide acclaim – with Robert Stephenson’s famous Rocket among the first locomotives to run on the line. If you’ve ever used the stretch of the M62 between its junctions with the M6 at Birchwood and the M60 at Eccles, you may have noticed just how uneven the road can be – and how often it seems to be re-surfaced. Local wisdom suggests that the ground beneath is so criss-crossed with mine shafts and extracted coal, even after over a hundred years, the soil is still settling into place, disrupting the surface. In the early 1890s, with the advent of the Ship Canal, nearby Cadishead suddenly became a hugely important location to load millions of tonnes of coal onto waiting barges. An early map of the canal shows a high concentration of recently-laid railway lines nearby, crossing the canal and terminating at loading areas on both banks – the viaduct remains today, albeit unused. It also indicates that while the immediate area around our Liverpool Road site remained quite agricultural in nature, even then, a mineral line ran alongside the canal, where today’s Cadishead Way by-pass (A57) begins. As the area began to prosper from its now enviable location, it was clear that the site around Hayes Farm was far too important to be left unexploited and a local railway historian suggests that around the turn of the 20th Century, it became the home of the Lancashire Patent Fuel Company, a manufacturer of fuel briquettes. Around the time of the First World War, the company was acquired by the Manna Oil Refinery, a name which would make newspaper headlines in 1915. It was on the 8th October that year that a fire broke out at the refinery. With highly flammable liquids stored on site and no public fire-fighting service in the vicinity, there was grave concern that a deeper tragedy may occur. Quickly, the Works Fire Brigade of the nearby Co-operative Wholesale Society (CWS), a volunteer force of 25 men and their horse-drawn appliance attended, with seven police constables holding back growing crowds, they were eventually supported by the Eccles Fire Brigade with their more modern, motorised, fire engine. Thankfully, no lives were lost although three of the men who fought the fire were severely burned. The damage to the site resulted in a £3,500 insurance claim (£370,000 at today’s value) and the resulting inquest decided that the Eccles Fire Brigade should take responsibility for Irlam and Cadishead. It would be another eight years until Irlam was afforded its own Fire Brigade and Engine. In 1916, British Tar Products opened a site at the end of Hayes Road, making explosives for the war effort, gaining a capability that extended beyond the war with the production of other oil-based products. Tar became an even more important part of the local economy when, a few years later, the Lancashire Tar Distillers opened a plant in the shadow of the Cadishead Viaduct. In 1932, the then Duke of York – later to become King George VI – the father of Queen Elizabeth visited Irlam to be given a tour of the nearby CWS Margarine factory and Steelworks. Around the same time, this aerial photograph of Cadishead was taken – our Liverpool Road site is unfortunately just out of shot to the left of the picture. With the country at war once again between 1939 and 1945, the area was vital to the war effort, supplying coal, steel and household goods to power and sustain the country. The strategic importance of the Manchester Ship Canal was not lost on the Luftwaffe, who repeatedly bombed Salford Quays, famously damaging Manchester United’s Old Trafford ground in the process. With so much vital industry and infrastructure, Cadishead did not escape the bombing, with properties on Liverpool Road amongst those hit by the bombs. By the end of the war, Cadishead was given an eerie reminder of the reason behind the hardships of the previous six years. With victory in Europe declared, the U1023, a 500-ton German U-boat, captured by the Royal Navy embarked on a tour of the country to raise money for the King George’s Fund for Sailors. She was sailed along the Manchester Ship Canal, passing a matter of yards from our Cadishead site, to Salford Quays, where she was on display between 6th and 11th July 1945. With the war won and, eventually, rationing over, Britain began to recover her prosperity and, by 1957, with the words of the Prime Minister, Harold MacMillan that “most of our people have never had it so good”, Irlam and Cadishead was indeed teeming with industry and opportunity. 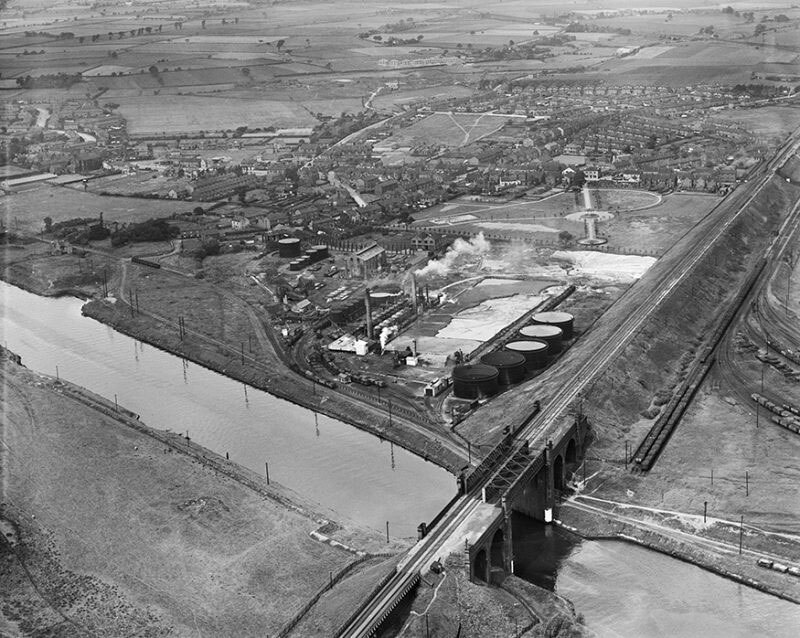 Aerial photographs of the time show a thriving steelworks in Irlam separated from the British Tar Products site in Cadishead by the Cheshire railway line approach to the Cadishead viaduct. Britain’s post-war resurgence was quite literally forged in places like this. On the morning of Tuesday April 14th 1970, five men were killed while being ferried over the Manchester Ship Canal by “Bob’s Ferry”, a service that had existed for almost a hundred years, which operated from Bob’s Lane, adjacent to our current site. Further upstream in Partington, a Dutch vessel was being loaded with 1,800 tons of petrol and, due to the negligence of those who should have been supervising the operation, upto 14,000 gallons had overflowed into the canal. It was never known what sparked the fuel but within seconds, upto a mile of the canal became engulfed with flames upto 60 feet high. On April 30th, a sixth man died, as a result of the injuries sustained. In the 1970s, times were changing and Cadishead seemed to be a perfect example of the transition from one era to the next. Like many heavy industries in Britain in the that decade, it was clear that decline had set in and in 1979, the Irlam Steelworks closed, resulting in redundancy and uncertainty for hundreds of local families. In the same year, a Cadishead-born graphic designer called Ray Lowry saw the release of his most famous work – the iconic cover of The Clash’s most famous album, ‘London Calling’. The demise of heavy industry coinciding with the rise of the creative economy and popular culture were apparent in many places in 1979 but in this respect, Cadishead seemed to be a microcosm of the whole country. In 1981, the Manchester Ship Canal railway closed, leaving the British Tar company to operate its own rail connection. By the mid-1990s, the Tar production stopped and the site was cleared, eventually used for housing development a decade or so later. Our site at Liverpool Road in Cadishead was by this point operated by Lanstar, a derivative company of the Lancashire Tar Distillers who had occupied a site in Cadishead for over 80 years and had developed an expertise in treating industrial and hazardous waste. With the emergence of ever-tightening restrictions on waste, this was an industry in its own throes of revolution and opportunity, just like Cadishead had seen with coal, oil and then steel over the previous century. With its enviable facilities and strategic location (although now, proximity to the motorway network had become more important that the Manchester Ship Canal), it was a prime candidate for acquisition and in August 2000, Lanstar Holdings was acquired by CSG. With such a rich history, and a key part in the Industrial Revolution, the Co-operative movement and then the subsequent decline of mining and steelworks, Cadishead and Irlam’s development has, to a large extent, become a textbook example in the very history of industry over the last two hundred years. With CSG’s focus on recycling and commitment to development to achieve better waste outcomes in future, it combines two of the most sought-after elements to meet the challenges ahead: environmental sustainability and the so-called knowledge economy. In many ways, this part of Cadishead is as well-placed to meet the needs of the future as it was when Stephenson’s Rocket raced past, all those years ago.